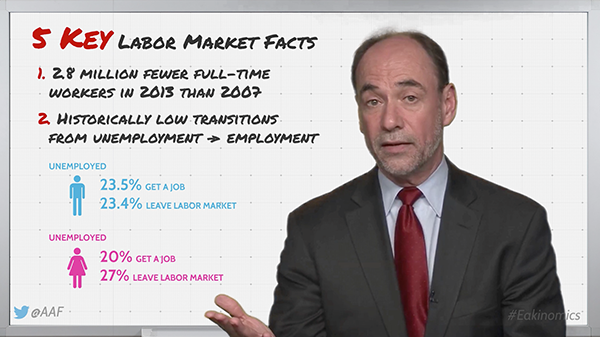 In a new #Eakinomics video, AAF President Douglas Holtz-Eakin discusses the state of the labor market with 5 key facts demonstrating the incomplete recovery. The labor market facts include that there are 2.8 million fewer full time, year round workers in 2013 than in 2007; the historically low labor force participation rate; and how the unemployed face a tough road to employment. “One of the things we are seeing is historically low transitions from unemployment to getting jobs. For men, in August 2014, if you are unemployed you have a probability of 23.5 percent that you get a job; just barely edging out the 23.4 percent of leaving the labor market entirely. For women, however, we are not out of the woods. There the probability of getting a job is about 20 percent. The probability of quitting is 27 percent,” Holtz-Eakin says in the video. “Things might look good at the top but underneath we still have a long way to go,” concludes Holtz-Eakin in the video.